Ah, Wonderland. It's not the worst place to be stuck, you know. Home of the surreal, the fantastic, and some of the most memorable characters in children's literature - the White Rabbit, the Cheshire Cat, the Mad Hatter, and we can't forget sweet little Alice herself. Wait, what's this? Alice is dead? How did it happen? Was it natural, or the work of someone sinister? And why can't you remember who you are? 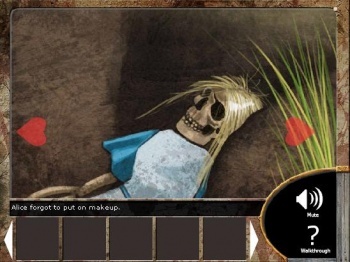 This is the first part of Alice is Dead, a point-and-click adventure series set in a version of Wonderland that seems a bit darker than you may remember. Now, we're not talking "American McGee" dark here, but from the beginning you get the feeling that there's nowhere to go but down. It's your standard point-and-click game - make sure you click on EVERYTHING that stands out, combine items to get special effects, and use everything on everything else. In the event you get stuck, the game includes a handy-dandy walkthrough, but ... you don't really need something like that, do you?